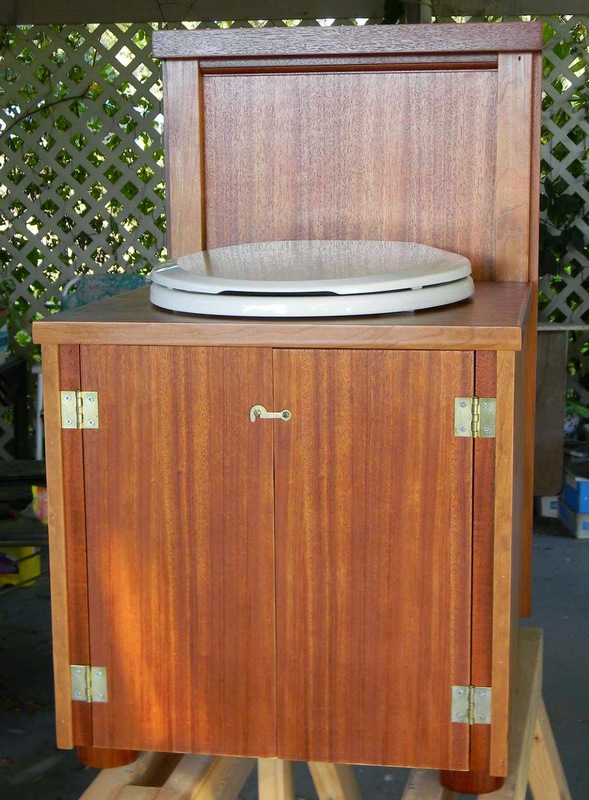 For this particular project, I had several pieces of Honduras mahogany that were left over from other projects. 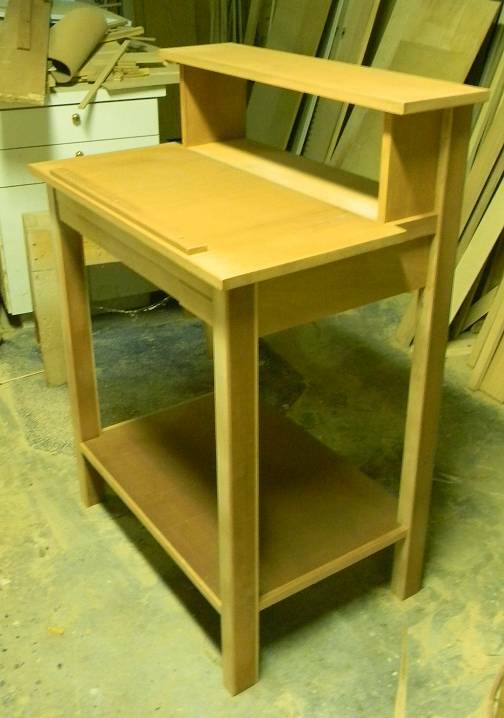 If you have scrap plywood, you too can use up the material and if you have a couple of larger pieces for the shelf and top section, you could practically build one inexpensively. 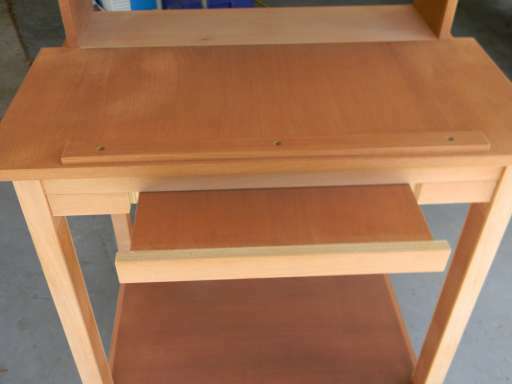 With this design, the top section is hinged to the front edge allowing the top to tilt up by sliding in two locks on each side that hold the top in that position. The uses for this type of table are endless. Here are just a few. This short list reveals that having access to a table saw is the #1 best way to accomplish the many cuts necessary in building your standing desk. In the design kit, a complete list of sizes that are needed are listed. This way, you can take the list to someone else to have the cuts made if necessary. There are also many square cuts to be made, you'll need a good miter box and cutting larger pieces of plywood requires a circular saw. I use a framing square or straight edge to clamp to the plywood a preset distance of the fence width to cut upon a line and ensure a perfectly straight edge. It is possible that the design could be assembled with screws but seems to numerous for many of the smaller parts, such as trimming the edges. The tilting top has pieces underneath that are notched to accommodate three different heights and these were cut with an electric jigsaw. "I occasionally recommend tools and when doing so there are many tools I would absolutely NOT recommend as they are defects made by major brands. I try not to link to these bad experiences. I also do not want to give any particular manufacturer a bad name, but would also like to express that we are getting tired of the downgrades sold at depots and perpetrated online. My most successful purchases have been from Porter Cable© and Delta©." 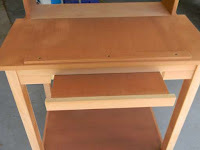 In the standing desk design kit offered, the standing height of the table is 36 inches in the design. If you intend to change the height, please make sure to adjust all the cuts on a cut sheet prior to beginning. The back section is at a 44 3/4 inch height, so the space between is 8 inches. Between the two sliding tilt locks is a pullout that can be made up to about 18 inches long. 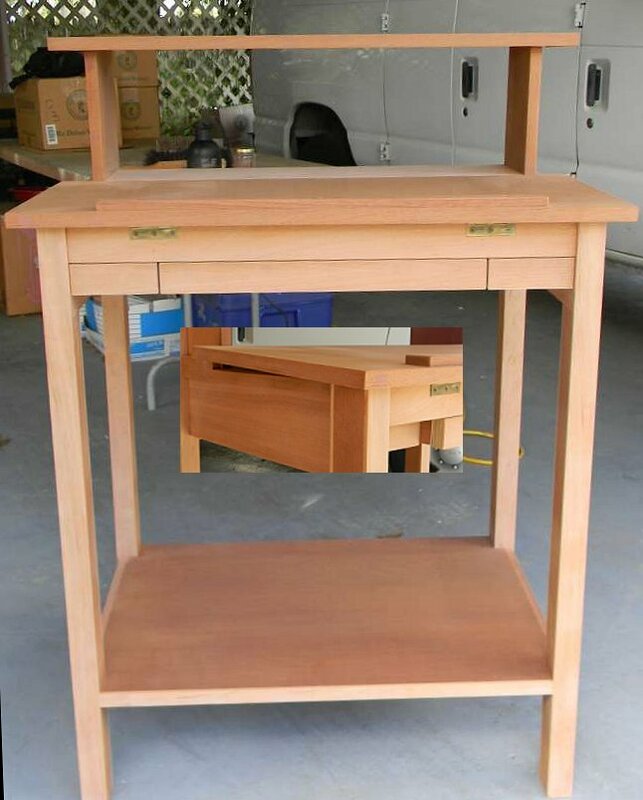 This could also be converted into a drawer with a little skill, that saying, the inside front may be altered to accommodate your preferences in reference to the sliding structure that has been laid out in drawings and instructions. The legs are cut at approximately 2 inches wide and two pieces are joined together that are 3/4 inches thick and providing the rabbits for the lower shelf which is part of the overall structure. 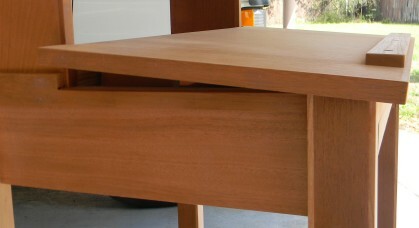 The grain sections of the material were then faced with cherry material that was left over material re-cut on the table saw and planed to size. This is where carpentry is at its best when the woodworker has the capability to remake any material on command. Very often, a piece of 3/4 inch material can be turned up on its edge and ripped from each end (at no point does the full piece being cut pass through the blade) leaving two pieces about 5/16 inch thick which then can be planed slightly on each surface and edge and giving the woodworker a smooth trim piece that serves well for edge facing. The only hardware necessary for the standing desk design kit is two hinges approximately 2 inches long and a half width of 15/16 inch or the appropriate overlay to match the top sizing. The tilt stop that is mounted to the surface top front edge is not glued on rather it has three brass screws. You may want to have a piece of aluminum or other material made to mount to the front edge, and in relation to a stop for either drafting or keyboard rest. Complete instructions including drawings and a step by step plan is included with your contribution of $5.95 and you can get access right now to the standing desk design kit and get started. You'll be directed back to a page where you can immediately access the online interactive instructions. 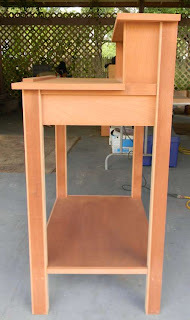 You will also want to possibly finish your standing desk by staining, and an appropriate clear finish, or possibly priming and painting the piece to your suiting. 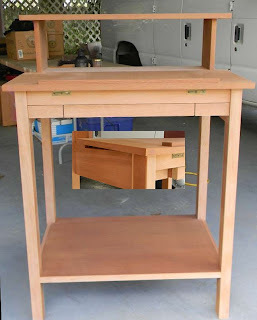 Some may want to just build the standing desk out of pine material with screws or a cheaper grade product and to use the standing desk as a work table in their shop. It's best to get started and start feeling better by not spending so much time sitting which becomes unhealthy. Good luck with your project. How Do You Like Being Exposed to 80,000 Unregulated Chemicals Every Day? The Scientific Consensus on Climate Change? Third World America: Paradise or Oblivion? Quantum Physics and Romanesque Art - Lothar Schäfer, Ph.D.
David Talbott: Exposing the Myths of "Settled Science"
Chris Hedges: "Markets and Morals." Rupert Sheldrake at Electric Universe 2013—"Science Set Free"
ShelterSense.info provides Independent News in blog format to assist other activists, teachers, and elders with alternative news, information on social issues, and research material. FAIR USE NOTICE: ShelterSense.info (website) may post copyrighted material not specifically authorized in accordance with Section 107 of U.S. Copyright Law allowing purposes associating learning processes. Please be advised if you intend to use such copyrighted material for personal reasons beyond "fair use," considerations, please obtain permission from the copyright owner. Learning processes encompass a vast array of issues of concern and would not be restrictive, it would offer critique and extended scholarly research. Website may display third party authors/advertising which may not represent the views or opinions of Website or contributors. Advertisements are not endorsed as such and are intended as alternative ways to support the work at Website. © 2012 - 2014 ShelterSense.info woodhowto.com division of original insight industries 1988 -2013. Picture Window theme. Powered by Blogger.